The nymphalid butterfly tribe Ithomiini (ithomiines) is one of the best studied groups of Lepidoptera, and has served as a model in research on biogeography, chemical ecology and evolution. The tribe is exclusively neotropical, containing approximately 370 species occurring in humid forests from sea level to 3000m, from Mexico to southern Brazil, Paraguay, and across three Caribbean islands. 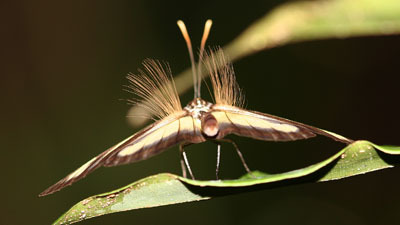 The Ithomiini are defined by a clear morphological synapomorphy, the presence in males of an elongate patch of erectile, hair-like androconial scales at the anterior edge of the dorsal hindwing. The tribe forms a clade with the Tellervini, containing the single Australasian genus Tellervo, together with the largely Old World Danaini, together forming the subfamily Danainae. One of the earliest attempts to portray the relationships among Ithomiini genera was that of Doubleday in 1847, who used characters of the venation and male foreleg to successfully unite several ithomiine genera and order them from basal to derived. His overall arrangement was refined, but little improved upon, by subsequent authors, until D’Almeida and Fox in the 1940s and 1950s established the currently recognised tribes and formed the foundation for future work. 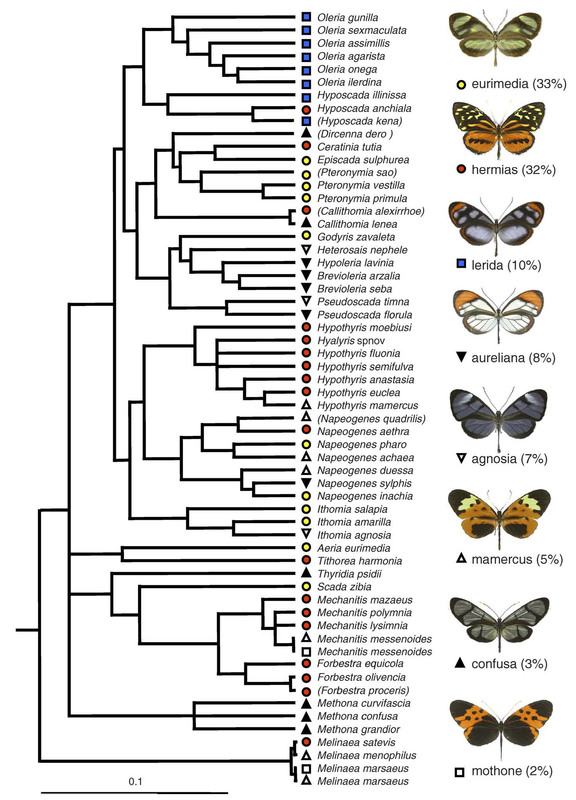 Application of cladistic methods to both morphological and molecular datasets developed over the past 2 decades has now provided one of the largest generic-level phylogenetic hypotheses for any group of butterflies (see below). Modern species-level taxonomy is based in a large part on the work of Keith Brown and Gerardo Lamas, who have been working for many years on revising the classifications developed in the 1960s and 1970s by Richard Fox and others. However, there is much work still to do, as described below. Adults of all Ithomiini are assumed to be unpalatable and warningly coloured, and many are models for palatable species of other lepidopteran taxa. Observing these butterflies stimulated Henry Walter Bates in 1862 to formulate his theory of mimicry, now one of the best studied examples of natural selection. Ithomiines are also extensively involved in Müllerian mimicry rings, which they numerically dominate, along with butterflies of the nymphalid subfamily Heliconiinae. Ithomiine unpalatability results, at least in part, from dehydropyrrolizidine alkaloids, which are obtained in the majority of species by adult males feeding on Asteraceae flowers and dried or withered Boraginaceae plants. The same alkaloids are also the precursors for volatile pheromones which males disseminate through the hair-like, alar androconial organs that define the tribe. Many Ithomiini are abundant, conspicuous and easily sampled, which has led to a relatively thorough knowledge of distribution in some groups. Ithomiine distribution data have therefore been used in identifying areas of endemism in the neotropical lowlands and testing the refuge hypothesis. Recently, we have begun examining geographic modes of speciation (Jiggins et al., 2006) and the role of the Andes in ithomiine diversification (Elias et al., 2009). Perhaps most notably, ithomiines are remarkable in their larvae feeding almost exclusively on plants of the family Solanaceae, on which they are one of the relatively few herbivores. 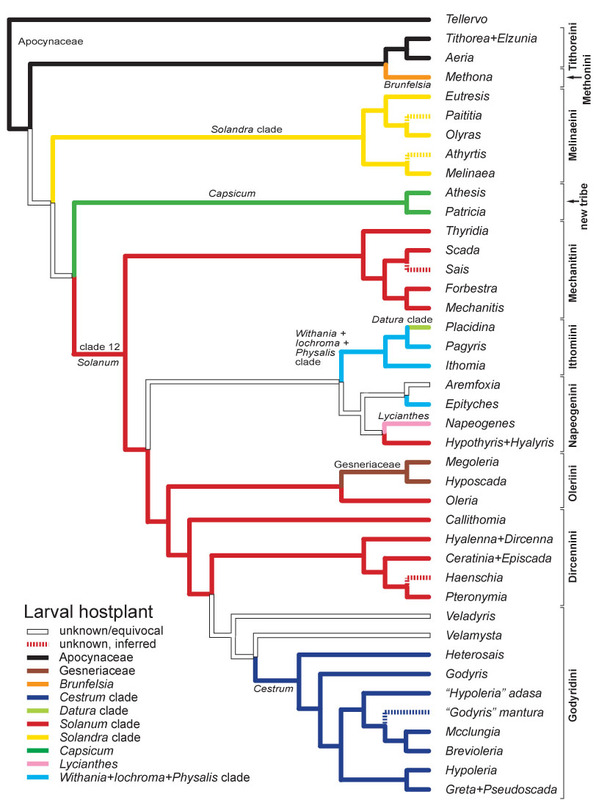 This close association between herbivore and host led to the group being used in seminal studies of insect-plant co-evolution. To date there is no evidence for traditional co-evolution, or matching cladogenesis of herbivore and host, but nevertheless the ecology of ithomiine-host interaction is likely to have been significant in the tribe’s diversification (see below). In 2006 we published the most detailed higher-level phylogeny of the Ithomiini to date, based on 353 characters from adult and immature stage morphology and ecology (Willmott & Freitas, 2006). Our inferred phylogeny was broadly consistent with a molecular phylogenetic study published by Andrew Brower and collaborators in 2006, with generally strong support for tribal-level clades. The phylogeny indicated that two changes are required to the existing tribal classification. The positions of certain genera, notably Methona and Callithomia, remain unclear, and we are now working on a combined morphological and molecular analysis which will form the foundation for a new tribal classification. During the course of our research it became apparent that there were problems with the classification of Hyalenna and Dircenna, and several species placed formerly in Godyris. Generic monophyly was established in Hyalenna and Dircenna through transfer of a species from the latter to the former (Willmott & Lamas, 2006), and we described a new genus for four species, two undescribed, that were once placed in Godyris (Willmott & Lamas, 2007). Addressing the classification of remaining problematic genera will be a research goal for the next few years. Pachacutia baroni Willmott & Lamas, a new genus and species described in 2007. Most of the genera in the tribes Oleriini, Godyridini and Dircennini have not been revised since their treatment by Haensch in 1909-1910. These genera comprise over two-thirds of the tribe, including 30 species that are undescribed, a remarkable 10% of all the species in these three tribes. I am therefore working with Gerardo Lamas, Andre Freitas and Fabio Vitale on revisions of Hyposcada, Oleria, Episcada, Pteronymia, Greta and Pseudoscada, and a review of Hyalyris, with revisions of Hyalenna, the new genus Pachacutia and Megoleria already published. Mullerian mimicry theory predicts that sympatric protected species should converge on a common warning colour pattern to facilitate predator learning. While this prediction is borne out among small groups of species, at the scale of entire communities pattern diversity is the rule, with up to ten distinct patterns, or mimicry complexes, occurring together. Differing microhabitat preferences among complexes may help to explain this coexistence, with, for example, one complex inhabiting the shady understorey, another characteristic of streamsides, a third occurring only in the forest canopy, and so on. If insectivorous birds, believed to be the main drivers of mimicry, have similar preferences, then there will be little selection for pattern convergence. 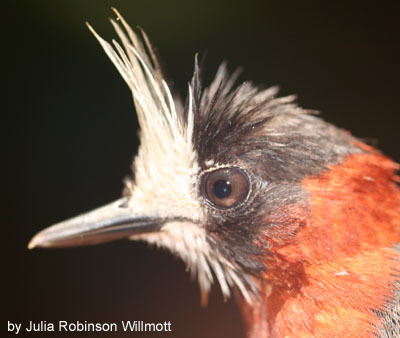 Together with colleagues Marianne Elias and Chris Jiggins, and ornithologist (and wife) Julia Robinson Willmott, we tested whether microhabitat partitioning by birds can explain the apparent coexistence of diverse mimicry rings. We studied two distinct ithomiine and insectivorous bird communities in eastern Ecuador during 3-month field trips in 2005 and 2006, mapping fine-scale distribution of both butterflies and predators. In concert with previous studies, we found that ithomiine mimicry patterns were segregated by flight height and microhabitat, and additionally by topography. Moreover, we showed that these similarities result from convergence along multiple ecological axes. 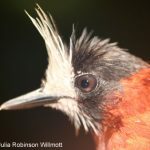 In a community where larval hostplants and adult resources are shared among multiple species, therefore, the mutual benefit of mimicry outweighs the effects of competition and phylogeny in shaping community structure (Elias et al., 2008, 2009).Our data in the lowland Amazon site suggest that bird microhabitat preferences can account for the coexistence of the two dominant mimicry complexes (Willmott et al. in revision), but other hypotheses, such as overlap of otherwise largely allopatric rings, may need to be invoked to explain the presence of some of the less common complexes. We also conducted surveys of hostplant abundance and distribution to test whether hostplant microhabitat is driving microhabitat preferences in butterflies. In a previous study (Willmott & Mallet, 2004) we found that co-mimetic butterflies often fed on the same hostplant species, suggesting an important link between hostplant microhabitat and mimicry pattern. Co-mimetic ithomiine species that feed on the same hostplant in eastern Ecuador (Willmott & Mallet, 2004). Mimicry is more than just an interesting phenomenon confined to a few select groups of organisms. Mimicry patterns can be seen as distinct niches in terms of predator defence, with hostplant and microhabitat constituting additional niche axes that ithomiine species might partition. A switch in hostplant might be accompanied by a change in microhabitat and therefore mimicry pattern, all of which are likely to cause reproductive isolation and potentially lead to speciation. A strong correlation between the diversity of Solanaceae clades and the clades of ithomiines that specialise on those plants is consistent with a link between hostplant switches and butterfly diversification (Willmott & Freitas, 2006). We are therefore using comparative phylogenetic methods to examine to what extent closely related, sympatric species partition niche axes and how adaptation might have been involved in speciation.